One of the great things about being on vacation is that I have no obligations and can do what I want. 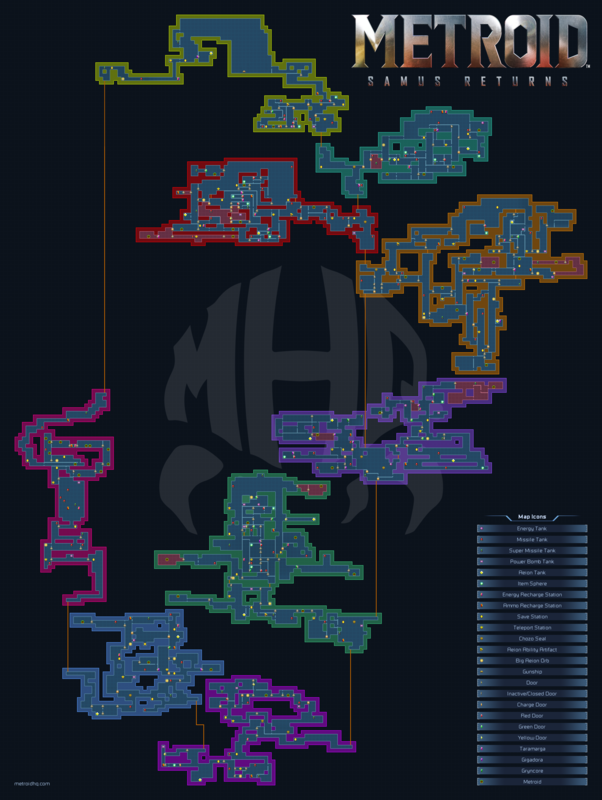 Well, Metroid: Samus Returns just came out and I felt like making a map for it with everything. So here you go. Great map, best one I've seen thus far. Only two areas I can see for improvement....the item spheres could be labeled for what powerup they actually contain, and the location of the non-metroid bosses could be added. Any chance you'll do a 2nd version to add this information? @kthulhu I'd just need three boss icons for the bosses. All the existing icons are from the game, so I or someone a lot better would have to make them. As for upgrade labels, yeah I was thinking about how to do that best. Without making icons for each of those, I'd have to find room and a way way to display labels for all of them, so I'll think about that. Was planning on switching out the icons with the raw transparent version ripped from the game anyway. Interesting that the loop was exactly one room off. Been messing with creating custom 8x8 icons for the suit upgrades like @Kthulhu was suggesting. I'm no sprite artist, but since they don't exist anywhere else and no one else has taken the initiative, I tried to sprite icons based off of the 3D models seen briefly in-game that matched the style of the other icons. Here's a sampling of what I've done so far in the Surface and Area 1, showcasing Morph Ball, Charge Beam, Bomb, Ice Beam, and Spider Ball icons. Let me know what you guys think. I think that, with the constraints of an 8x8 area for each sprite kept in mind, these sprites are pretty decent. I like the use of mostly-flat coloration, helping those items to pop out of the pic. Are the Aeion Ability statue icons going to be replaced and updated, also?